Check out this coolio/awesome slide show of me, Cag97 that I made on Slide.com recently! Well, I hope you enjoy it!That’s all for now!Over and out!Bye Clubpenguin people! Alright.New site, new servers, and more!You will totally not recognize the Clubpenguin site!There’s a few bugs but, IT’S AWESOME!Enjoy it!Because I definitly did!O and before I take off, theres ALOT of new stuff this awesome month.So enjoy all of them!I know I will.LOL.Well, that’s really all I wanted to tell you guys, so see you on Clubpenguin peoplez!Bye everyone! There’s finally an Aqua Grabber update!I’m so happy!I beet beet the new update.It’s really fun.You should try it.I did’nt really want to say anything.All I had to say was about Aqua Grabber.So you can go play it now if you want.I’m bored.Well, bye!See you everyone on Clubpenguin! New catalog!I got ALL the items for boys.Not girls.I did’nt find out about the hidden items yet, so I can’t tell you anything really.But, i’m just saying theres a new catalog i’ve been dying to see.LOL.Well, thats really all I wanted to say.See ya all on Clubpenguin!Bye all of you penguins out there! Ok, Clubpenguin is working on this project.Everyone in Clubpenguin is a puffle!But only a green puffle.You can do anything a green puffle does though.It’s really cool.I love flying through the air.But it did’nt last long.Sorry if you did’nt see it.O, and you get 20,000 coins when you first join it!Well that’s really it.Sorry that the picture is blurry.Bye! 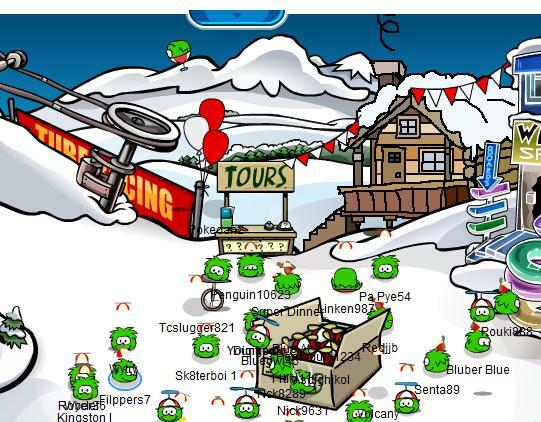 Sorry I hav’nt been posting a lot.Anyways, there’s the April Fools party!You probably don’t care, but I finally have the hover cap thing!It’s located at the Ski Village.A new item also at the cove.Weird glasses type thingy.Well that’s all.Enjoy the party.Cya on Clubpenguin.Bye! Please view my Youtube videos.To see them, search my name, ”Cag97” and watch!They are so cool.I always make new videos.Also, dont forget to view this site when you can!I make a lot of videos, so enjoy the entertainment!Well, that’s really all I wanted to tell you guys.Bye everyone!Cya on Clubpenguin!O and here’a a link to my vids.Click here. P.S. I make all sorts of videos, action, horror, interviews, and lots more!